Mixed flow fans incorporate an element of centrifugal and axial flow to their design and so are capable of generating much higher pressure than ordinary axial fans whilst still producing the flow inline. 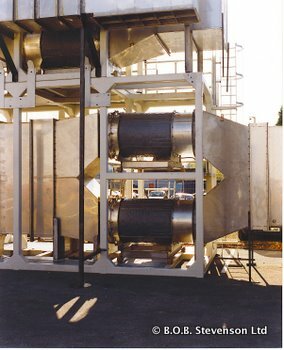 Mixed flow fans also exhibit a non overloading characteristic where fluctuations such as a clogged filter do not result in the fan stalling. 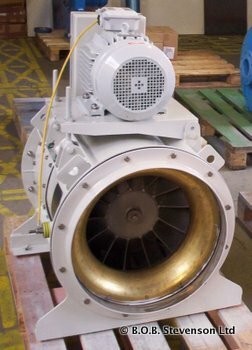 Our belt driven Flamgard mixed flow fan range is available in metric case dimensions of 300, 400, 500, 630, 800, 1000, 1250mm diameter with flanges drilled to suit. Flamgard mixed flow fan cases and impellers are generally fabricated from thicker section stainless steel in 316L or 304 grades and are intended for operation in arduous conditions and will incorporate brass anti spark protection. 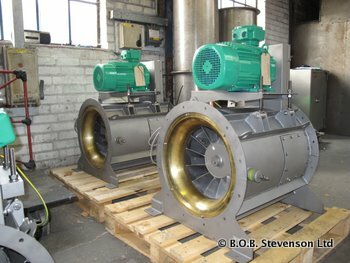 Higher specification driving motors such as Exde may be fitted to these belt driven fans which will usually incorporate a removal belt guard for inspection purposes and extended grease lubrication for the fan shaft bearings located within the central pod within the fan casing with downstream guide vanes to increase static regain. Flamgard mixed flow axial fans are available with a range of ancillaries such as flexible connections, backing flanges, spigot flanges, fan feet, Anti vibration mounts, vibration monitoring, rotational sensors, bearing thermo-couples.